My tiny room got more crowded. At the same time, I'm feeling down. I'm bored. I'm sad. So, I realized... I had to do something with my room! 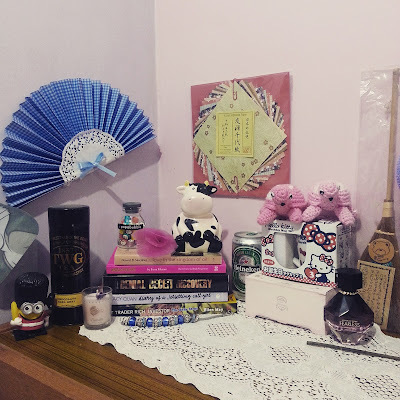 With Anggun's song, 'Still Reminds Me' played in my room, I spent my weekend sleepless for something fresher, different angle of my first HOW-TO post about decorate your bookshelf. One thing remains the same---book cover design is still the best as centerpiece. 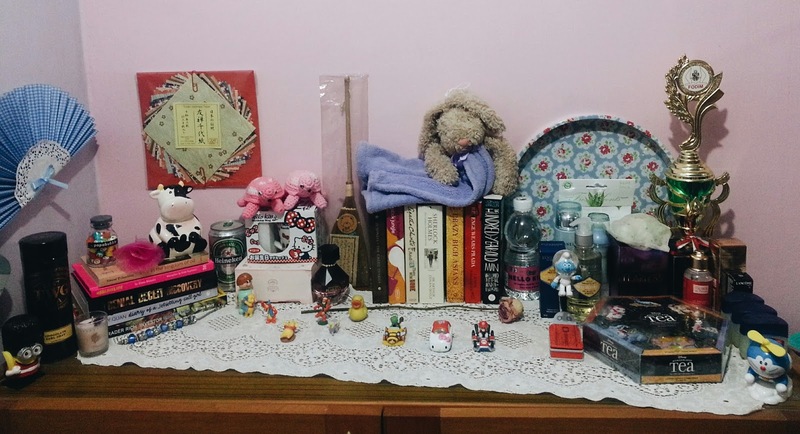 Now, time to have your room decorated with books, even with ones you don't like. 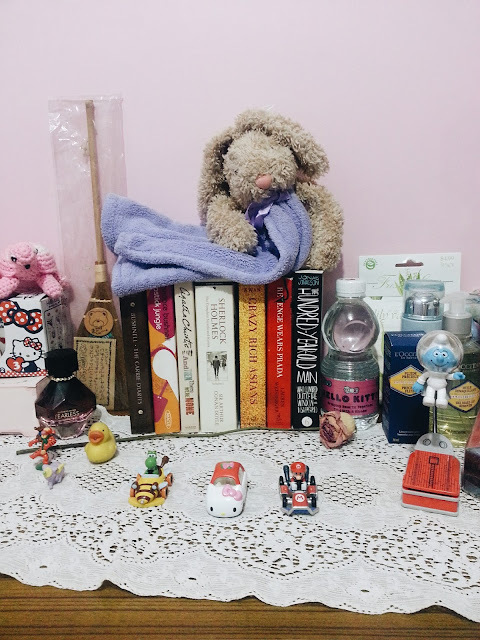 As books always have special place in my heart (just like magazines, animals, toys, video games and other random stuffs), I decided to have them as my decorations. Yes, they give you something to learn, something to think about, something that inspires you... and you can also have your book collections as piece that cheer up the mood in the room. How surprisingly limitless innovation! If you had read my previous post about Papabubble candies to sweeten your bookshelf, you can still use this trick to have cheerful touch. If you wanna have book piles in pyramid-shape, pay attention on the length and the thickness on the book. Don't put very thick Larousse dictionary with Barnes & Noble SparkNotes which comes very thin; and, not to put a very long one like children's bedtime stories book together with small paperback one. Those two are big NOs. I know you know better... Just stay calm, coz it's easy. Make it proportional... and everything will be fine. The pyramid pile would look good if you put in the middle of other tall and medium decoration piece, which could be anything. 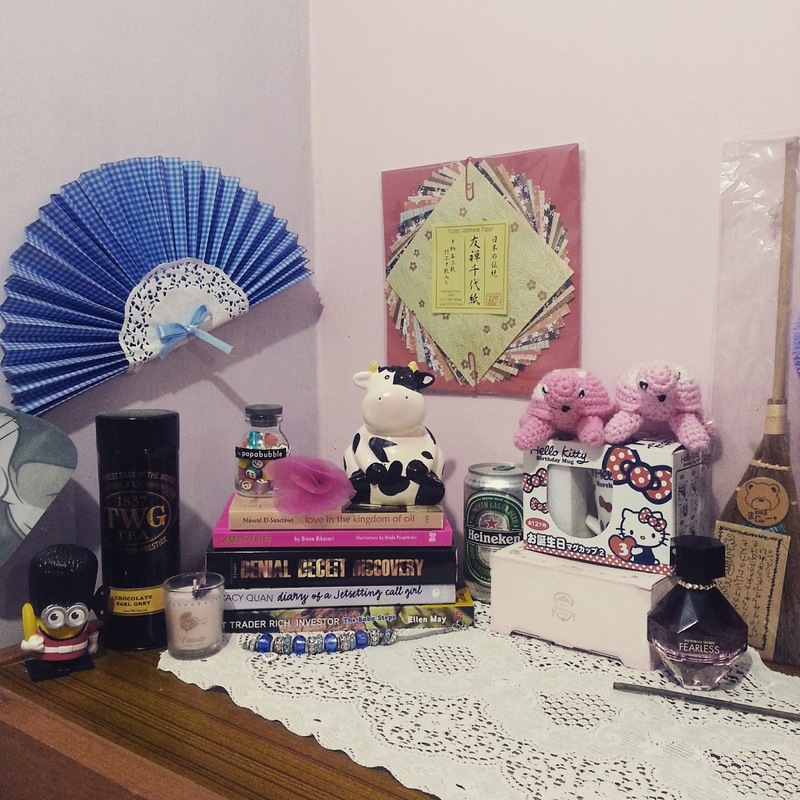 For this case, I choose my TWG tea can. On top of the book pile, do your best with cute taste. Place a photo frame, action figure, or anything not heavy and big... that should do it. Setting the pyramid-pile books would cover rigid corners, too. 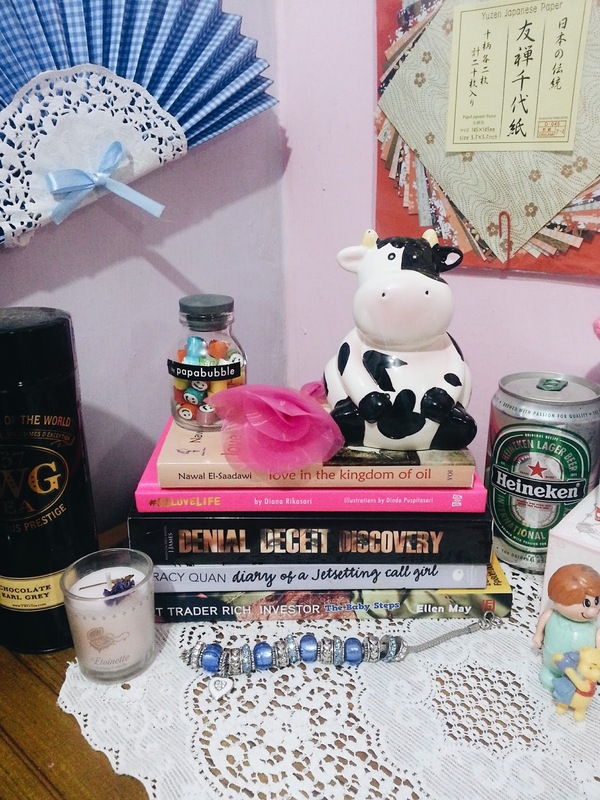 Plus, put a tea light candle or other small-size candle in front of one book end. I moved some of my small friends from first bookshelf as all of the animal characters are crowding it. Need to transmigrate them to this new land. And then.., with small buddies from first bookshelf moving in here. If you want to have an OCD style. I mean, looking more organized, then you should try stacking the books with same-size groups. Thick books are pretty if you stack them both vertically or horizontally. If they come in almost the same tall, then, try to stack them vertical in zigzag to make it unique. And that could happen nicely when you have more space on both sides of the book pile. You can do this for your desk and place a calender on top, or for your nightstand with alarm clock above (note that don't stack too high). Horizontal row is just casual, as we know. Place small action figures on top of the book piles. I put my bunny posing on mine. You can always row your toy troops (small-size ones, please, or else the books aren't seen enough) in front of the book rows. With my Bunny sitting gorgeously on top like a mermaid. What if the books are so thin? Like short children book? Hmm... if you have space, place them with front cover facing us. 2. Forget Genres, Would You? Book covers, mostly, have interesting color and design. For now you can forget about piling book based on genre or category, except you want them stay accessible in future/sudden need. Combine books with random side cover colors for surprise effect. Sometimes, side part of the cover could be very artistic, or the sides could act as puzzle if they stay together in order. There's always a DON'T: place a book with pattern not with almost the same crowded pattern, find lighter pattern or just choose blank one (just one color or mild gradation). The font of the side covers also affect your eyes when you see them. Get big sizes with medium sizes and small sizes. Or else, get the one with cute font. Just like what I have told you before, you can put this book pile at desk, night stand, and favorite corner. The tips to have a good book pile is also working if you want to have the books in a real shelf. What I am trying to say in break the boundaries is... books aren't always going with flower or anything. Me? 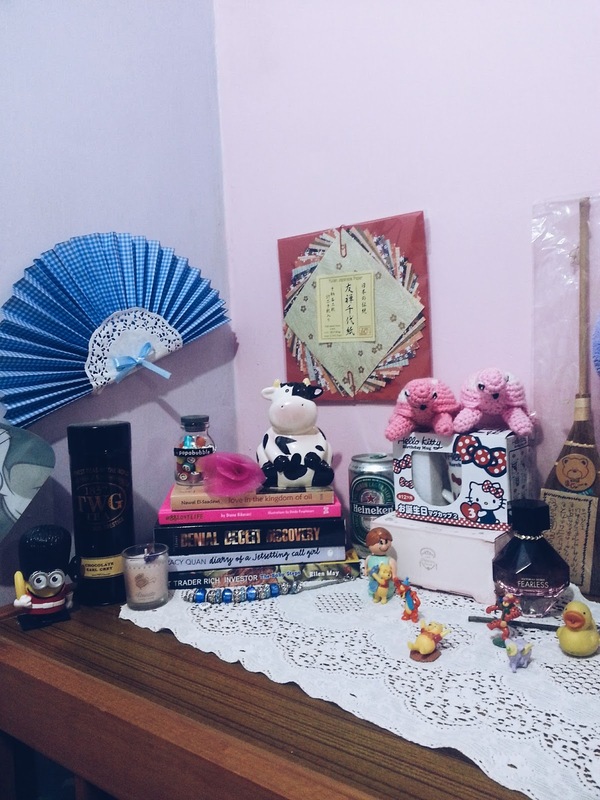 With beer can and favorite Hello Kitty mineral water bottle. And here's to introduce my recently-bought Hello Kitty bottled water....used as my bookend. 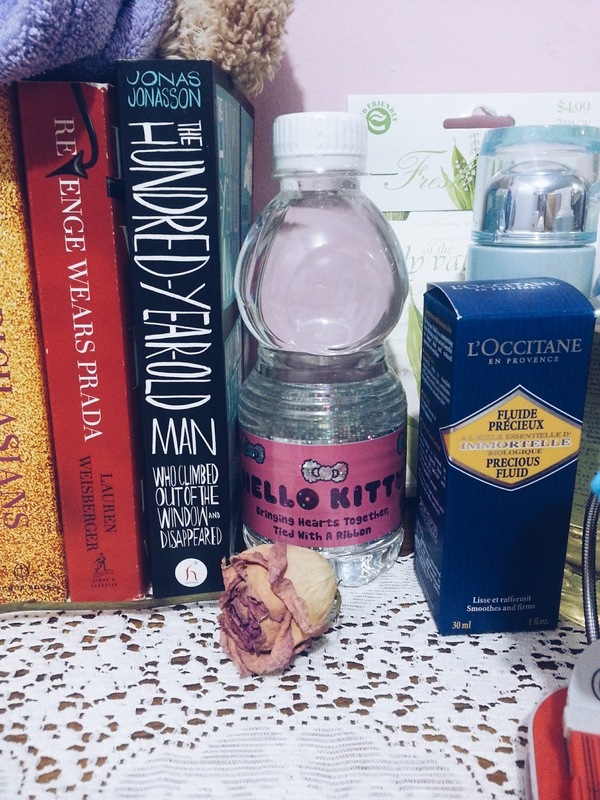 Actually this part should be vanity, with my everyday-use skin care like L'Occitane and Laniege moisturizer, night cream, toner and Vaseline petroleum jelly, makeup remover---L'Occitane's Immortelle Cleansing Oil---and Roses et Reines Body Lotion. I have two tables in total, another one to keep the makeup and as well as the drugs (and other books, too). Books are just amazing to be side by side with them, right? I put my blue round floral tray at the back, eventually, looking like a happy plate decor. Not bad, huh? I also decided to put something over this on the wall to bring more vibe. It's supposed to be vanity actually, then I decided not to make it fully a vanity. I want no big mirror attached. Why? Coz I'm afraid to look at my own or any reflections too often. Only small portable mirror allowed in my room. Weird, yes, thank you, I know! Sorry if the photos are too dark. For these photos, I played some filters: A5 and A6 from VSCOCam, and Crema from Instagram. They don't fade the real color, but giving a moody touch for the overall look.